When it comes to tooth loss, dentists can offer patients a variety of restorative options, including dentures, partials, or bridges. While these tools may meet the needs of some patients, others find themselves wishing for a more natural, long-lasting solution that can make their smile look and feel as good as it did before their dental problems. While our team at D’Amico and Mauck, DDS can’t turn back the clock, we can give you the next best solution: dental implants. A relatively new procedure in the world of restorative dentistry, dental implants can offer newfound stability, comfort, and beauty to the smiles of our patients in Aurora, CO and beyond! 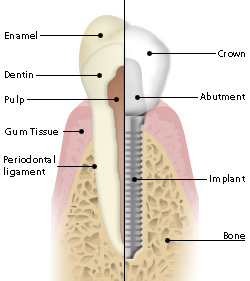 While other tooth replacement options rest on top of the gums and only restore the crown of the tooth, dental implants take your oral health a step further by replicating the entire structure, including the root. First, a trusted oral surgeon will place a titanium post into the empty socket. Then, once an appropriate amount of time has passed for the post to integrate with your jawbone, you’ll come in to see Drs. D’Amico and Mauck at our Aurora office, where we’ll attach a beautiful, custom-made crown to the implant, completing your brand-new look. Bone deterioration often occurs in the jaw when teeth are lost. Dental implants are the only tooth replacement solution that integrates with the jawbone, sustaining and even regenerating tissue. They offer a way to rebuild your smile without having to sacrifice the health of your remaining teeth. They’re much more sturdy and comfortable, not to mention seamless! Don’t leave tooth loss untreated – call our dedicated team at D’Amico and Mauck, DDS today if you have any questions about dental implants, or if you’re ready to schedule an appointment. Dr. D’Amico and Dr. Mauck will be happy to sit down with you and discuss the unique benefits of all our restorative dentistry options in order to find the one that fits your unique goals best. We welcome patients from all over the greatest Denver area, including Centennial, Eaglewood, and Parker.